Our Kaya Kalpa Program is a unique proprietary program offered only at very few places in the world. It was developed through research of ancient texts of ayurveda and yogasutras and is a powerful combination of ancient ayurveda, yoga and meditation therapies for Anti Aging and AGE REVERSAL. The word ‘kaya‘ (body) not only refers to the gross body of a person but to the subtle body as well. This natural alternative medicine recognizes that the body of a person is the product of the constant psychosomatic interactions. The imbalances in the threedoshas of vata–pitta–kapha occur sometimes by the mind and sometimes by the body’s dhatu (tissues) and mala (toxin deposits). Hence, the kayachikitsa branch of this system of herbal and holistic medicine, delves deep into ascertaining the root cause of the illness. Then only a suitable treatment is recommended to bring back mind and body into balance. Though the prescription might give an impression that the treatment is meant for the physical body, these in fact have a strong impact on mind and soul of a person. The Charaka Samhita is the most important scripture on kayachikitsa. It discussed the basic principles of treatment (mentioned above), various types of therapies and purification or detoxification methods i.e.panchakarma. But, its thrust area has been diagnosis of a disease. Detail account of various methods of diagnosis, study of various stages of symptoms and the comprehensive management of debilitating diseases like diabetes mellitus, tuberculosis, asthma and arthritic conditions. The section of Nidana Sthana of Charaka Samhita deals with etiology, pathogenesis and diagnosis of an illness. Six stages of the development of disease are enumerated as aggravation, accumulation, overflow, relocation, build up in a new site and manifestation into a recognizable disease (it is interesting to note that modern medical science can only detect a disease during the fifth or sixth stages of the illness). In kayachikitsa there is always an opportunity to stop the disease at each stage preventing its full manifestation. 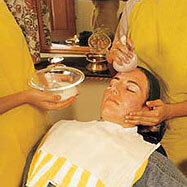 One of the significant methods of treatment under kayachikitsa ispanchakarma. This is a method of reversing the disease path from its manifestation stage back into to its site of original development through special forms of emesis, purgation and enema etc. Another unique aspect of kayachikitsa is rejuvenation called kaya kalpa. The term kaya kalpa means renewal of body. According to ayurveda the human body is made of seven types ofdhatu or tissues-structures-plasma, blood, muscle, fat, bone, marrow and reproductive fluids. To prolong the youthfulness of the body kayachikitsa applies several physical and mental disciplinary methods with special medicinal preparations, to rebuild the body’s cells and tissues after the initial process of detoxification, through panchakarma. All therapies in ayurveda aim to provide good all round health, so that people can engage in achieving the real goal of life-self-realization. The rasayana therapy increases the life force (ojas) and immunity of a person and thus there is a regeneration of cells and tissues in the body. Rasayana is a therapeutic process to defer old age. The sages of ancient times led long, disease-free, and vigorous lives with the help of rasayanas. Lord Indra is supposed to have given the knowledge of these panaceas to the sages. Literally, rasayana means the augmentation of rasa, the vital fluid produced by the digestion of food. It is the rasa flowing in the body which sustains life. Rasayana in ayurveda is, the method of treatment through which the rasa is maintained in the body. Another connotation of rasa in ayurveda is that it is a herbal medicine, which maintains the life and health of the individual, and increases his bodily and mental vigor. herbal medicines are categorized according to whether they promote general health and longevity, sexual vigor, immunity. The three medicine categories are known in ayurveda as rasayana, vajikarana, and aushadhis, respectively. These categories are complementary to each other. Rasayanas prepared from the herbs and medicinal plants ofamalaki, haritiki, triphala, bhringaraja, ashwagandha,punarnava, chitraka and many other herbal medicines have been used from time immemorial and have been instrumental in giving long, disease-free, and vigorous lives to their users. The human body contains some chemical elements, which are known as trace elements. Nine such elements are now recognized: cobalt, copper, fluorine, iodine, iron, manganese, molybdenum, selenium, and zinc. Ayurveda has always been using various metals, jewels, and pearls as medicines for certain deficiency diseases. These elements are turned into calxes or bhasmas for administration in different diseases. Calxes of gold, silver, copper and iron are widely used. Jewels or ratnas include precious and semiprecious stones, which are used as drugs because of their therapeutic properties. Major jewels or maharatnas include: diamond-hiraka; ruby-manikya; pearl-mukta; topaz-pushparaga; sapphire-neelam; emerald-tarksha; cat’s eye-vaidurya; zircon-gomedak; and caulk-vidruma. Uparatnas or minor jewels like sun-stone-suryakant , moonstone-chandrakanta, and crystal-sphatik were in use. The calx of diamond is a powerful cardiac tonic and one of the best elixirs. It was applied in curing diabetes, urinary troubles, and anemia. Because of its powerful aphrodisiac qualities the calx of diamond was used to treat impotence. The calx of rubies was used to increase intelligence, virility, and longevity. It also cures disorders produced by the vitiation of the three doshas. Much more than physical health, ayurveda begins with healing genetic physical weakness. It goes a great length to ascertain these inherited hindrances in one’s being. Then it recommends practice of suitable lifestyle regimens, which guard those faults, and use herbs and essential oils to heal and mend those weaknesses. Another aim of ayurvedic is to ensure balance of the three doshas. Following these rules the rasayana branch of treatment resorts to herb preparations and oils, bodywork, meditative practices,mantra exercises and breathing/pranayama to attain total mind-body healing. Rasayana oils have properties to bring balance in specific dosha types. The Rasayana therapy is taken in two different ways: Kutipravesika In this process, elaborate arrangements are made for the construction of a special type of cottage where the individual is supposed to stay secluded, while taking the Rasayana. The person has to strictly follow the diets and other instructions of the physician. Here, he undergoes the detoxification process calledPanchakarma therapy before taking the rejuvenation. Rejuvenation is done with help of some specific medicinal formulations and a specific lifestyle regimen. Kaya kalpa is a special rejuvenating method. The term kaya kalpa means renewal of body. According to ayurveda the human body is made of seven types of dhatu or tissues-structures such as plasma, blood, muscle, fat, bone, marrow and reproductive fluids. To prolong the youthfulness of the body several physical as well as mental disciplinary methods along with rasayanas or herbal medicines are used, to rebuild the body’s cells and tissues after the initial process of detoxification-panchakarma. Kaya kalpa is that unique therapy, which brings about complete rejuvenation of the body through cell and tissue renewal. It is supposed to endow an individual with longevity, memory, intellect, youth, strength of sensory and motor organs, even, an excellent complexion and voice.